In junior high-school, I was a member of the school’s baseball club. I played as a shortstop. 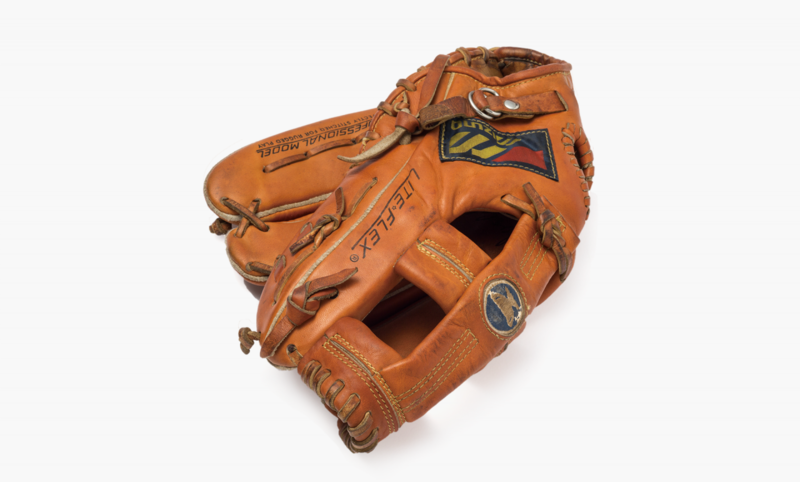 For quick fielding and throwing, the ideal glove needed to be small, with a shallow pocket. The glove I had used since elementary school was the exact opposite of that, and so after joining the baseball club, I wanted a glove that fitted my new position. After fierce negotiations with my mother, I finally got the glove I had longed for, the Mizuno ‘Blue Cup’. And what a cool glove it was. I was delighted and kept scrutinizing it from every angle. I remember taking the glove to school every day, just because I wanted to take good care of it. This glove was my first experience of feeling a strong attachment towards an object. I can only hope that our customers feel the same deep affection for our products that I felt for this glove — especially the younger customers, who may have saved up their pocket money to one of our lenses or cameras. As manufacturers, I want to be considerate of our products’ life, from their creation to the time they spend with our customers. The Mizuno “Blue Cup” was an icon in rubber-ball baseball. The logo of a winner’s trophy was at one time the dream of many young boys playing baseball.